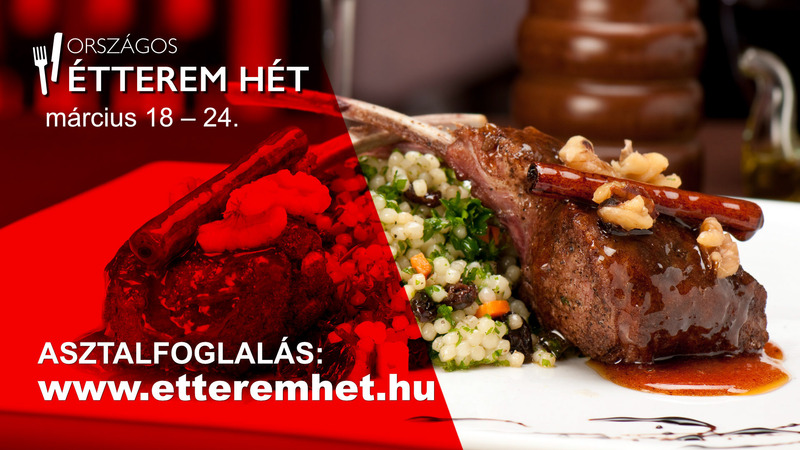 “Hungary’s Restaurant Week” Eatery @ Budapest and Countryside Restaurants – 2019. During the Restaurant Week – 3-course dinner at top restaurants, with participant restaurants offering their menus: 3900HUF, the premium menus: 4900HUF and the exclusive menus: 5900HUF. Not just for locals, but foreigners staying in Hungary and tourist on a short visit can be considered as interested in a country’s traditional, an international foods. So foodies lovers your time has come and for those perhaps who have not had the experience already to join one or more restaurant in Budapest during Hungary’s Restaurant Week take this as a call. These discounted prix fixe menus at more than dozens-and-dozens of delicious eateries for lunch and/or dinner can be a good idea. Be on the voyage of meals that delights your eyes, taste on the plate that defines the art of dining when siting down at one of the chosen Restaurant between March 18 -24. 2019. To participate, reserve a table during Restaurant Week is easy! No tickets or passes are required! Reservations are strongly recommended to make sure you’re able to sample your favorite flavors, or get to know the new Hungarian flavors! The public is invited to experience cuisine that will amplify your palate and highlight the fun of dining in Budapest and/or at the indicated country’s regional restaurants. Food lovers may simply dine out at as many participating restaurants as they wish. No long phone calls are required, nor waiting for confirmation. Written confirmation follows by e/mail immediately after the reservation. Enjoy your meal … good appetite and don’t forget to taste the fruity pálinka, and the fiery succulent wines from award-winning wine makers. Reason1. … would be to visit the Gyula Castle Spa, one of the third superb in every sence at the bath of mineral healing water. The members of press were taking on a spa tour by Vanda Dombovári – communications and marketing director and learned once you are at Gyula don’t be on a run to gain that special experience. Enjoy every minute healing your body and soul. The Gyula Castle Spa at 8.5 hectare park of the Almásy Mansion, that also stands as nature conservation area. Each year thousands of Hungarians, foreigners from Austria, Germany, U.K. and from the other side of the border reach a number of 10000 guests per day. A mass visitors year-after-year again returning as guests, spending short and long stays during their holiday. The Castle Spa has also a therapeutic contingent operating full year around with assistance of supervision of rheumatologist, physiotherapist and sports specialist. More than thousands of words can be said of the awesome power of natural mineral water coming from beneath 2005 meters in-depth chlorinated healing water of 72C reaching 10 pools. but to feel the healing heat of the spa must Visit Gyula to have that experience. It also has a 3-5 meter in-depth diving pool for adrenaline lovers. Slides cannot be missed , where there is a family slide, the very popular “light tunnel”, also body slide and enjoying the one and only in Hungary the unique sliding going upwards inclining the dropping in line tube slide in a unique way. Playground in the pool for small children with their Mum and Dad where they can explore the water world. There is also a nursing room converted as a special place e.g. warming baby food etc. To enhance with family, friends with a separate ticket can visit the Aqua Park where throughout the year’s 4 season provides fun and entertainment for all age to relax and heal at the same time at this 5 stars in-and-outfdoor baths. In between the visiting the marvelous Castle Spa, before heading to the Almásy Mansion our day’s plan organized by Dr. Ernő Görgényi – Major of Gyula and Aliz Komoróczki – managing director – Gyula Tourism Office was invitation to ease our appetite at the another excellent gastronomy place, the Várkonyi Bistro and Bar. The food was just from the oven, yummy and top class. Reason2. … to visit the Almásy Mansion … was a fine time to visit, because the temporary exhibition titled „Relics of the Martyrs of Arad in Gyula” is on view until March, 19. 2017. These martyrs played a huge role in the Hungary’s history, 10 out of 13 generals later executed in Arad for their part in the Hungarian Revolution, surrendered on the premises of the mansion at August, 23. 1849 and left for Arad to meet their fate. Feel like going back in time and enjoying the atmosphere, relaxing as in the old days the residences of the nobility did. You will be certainly driven on the path of Hungary’s history lane by the power and emotion that the Almásy Mansion holds for the visitors. There are permanent and temporary exhibitions throughout the year. The Almásy Mansion has a long history … following the reduction of the territory occupied by the Ottoman Empire, Baron Johann Georg Harruckern of Upper Austria was allowed to purchase almost the entire territory of Békés County from the Holy Roman Emperor Charles VI, the King of Hungary, in return for his services in the wars against the Ottomans. He set about intense repopulation in Békés County. A large number of Hungarians, Slovaks, Germans and Romanians arrived and settled in the county. At the Mansion, there is a possibility to purchase, select some gifts from craftsmen of the Békés Country at the mansion’s souvenirs store. There are replicas of objects and items to take home as a piece of the Hungarian history. These items surely will hold memories of your stay at Gyula – Hungary. While exploring its exhibition it’s a fine time to have an exquisite coffee with their speciality of cream cake, beverages offered at the Mansion Café. To reach both venues from Budapest drive on the M5 motorway and the M44 road and guests arriving from Szeged or Debrecen along the 47 road via Békéscsaba will arrive to the City of Gyula. Below a bit of background about the Almásy Mainson (source: Almásy Mansion). “The Almásy’s is an old noble family from Zsadány and Törökszentmiklós, were linked to the mansion through the marriage of Countess Stephanie Maria Wenckheim and Count Kálmán Almásy. Their son Dénes (Dennis) and his wife Ella Károlyi Almásy were very popular in Gyula due to their “infinite modesty”. The count’s wife donated large sums to support the building of the grammar school and the nearby József Sanatorium. Reason3. … Can heartily recommend to gain own experience, explore the real gem that determines the city by Visiting Gyula!